Travel and tourism drive Oregon’s economy. How can we better equip those working its frontlines? The receptionist greeting you in the lobby of that glowingly reviewed hotel. The server taking your order in the restaurant a friend raved about. The wine associate guiding you through a tailored tasting menu. These moments can seem small, especially in the context of a larger exploration of Oregon’s countless culinary and natural wonders. But often, they’re among a visitor’s first face-to-face encounters, and the impressions they leave can be surprisingly long-lived. A negative experience with just one person in an organization is enough to send 67 percent of customers packing, according to the American Society for Quality, whereas a mere 14 percent will leave because of simple dissatisfaction with a product. How to keep those customers content and coming back for more? Better training for the frontline workers who welcome the guests, serve the salmon and pour the wine is key to keeping Oregon’s hotel rooms, dining rooms and tasting rooms filled to the brim with happy patrons, say two industry experts. Here’s how they’re making it happen. Enthusiastic, authentic, passionate: Oregon hospitality gets a lot right, notes Wendy Popkin, Executive Director of the Oregon Restaurant and Lodging Association’s Education Foundation (ORLAEF). What its workers need now, she says, is the deep technical know-how that will enable them to delight guests today and build long-term careers in the years ahead. That’s where the Oregon Restaurant and Lodging Association comes in. 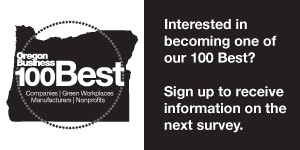 The 3,000-member organization represents more than 9,000 Oregon foodservice locations and 2,200 lodging establishments, and its non-profit Education Foundation is honing an ever-expanding menu of training resources for those carving out careers in travel and tourism, from high school and entry-level hopefuls to mid-career veterans. With Travel Oregon, ORLAEF is now creating a statewide training program culled from the Guest Service Gold curriculum developed by the American Hotel & Lodging Educational Institute, tailored to address the unique needs of Oregon’s travel and tourism industry workers. Not all of these workers will remain in the travel and tourism industry for the duration of an entire career, says Popkin, but the customer service skills they gain from such training will benefit whatever sector of the workforce they do land in. Service with a smile is important, notes Chehalem Valley Chamber of Commerce Director Sheryl Kelsh, but you’d better back that impeccable service with a deep understanding of the product you’re selling. In the North Willamette Valley — which houses 58 percent of Oregon’s 1,000 vineyards — that product is often wine. When it’s served up by knowledgeable, friendly staff, she says, visitor satisfaction skyrockets. At the Chamber’s Wine Education Center in Newberg, visitors can take wine appreciation classes and study regional wine history, but the center’s also a testing ground for educating travel and tourism workers the region over. Feedback from surrounding wineries and restaurants inspired the creation of a Tasting Room and Hospitality Associates Course, funded partially by a grant from the Oregon Wine Country Plates Matching Grant Program and designed to help tasting room and restaurant staff polish their food-and-drink expertise. Just how important is travel and tourism to Oregon’s collective livelihood? Our state has the industry to thank for $10.8 billion in revenue, not to mention more than 105,000 jobs for Oregonians. And as the visitors keep rolling in, top-quality training for the workers who present the face of Oregon’s hotels, restaurants and wineries to the world will remain essential, predict Popkin and Kelsh. Going forward, Popkin hopes to bring the 60 percent of tourism industry employees not working in hotels or foodservice into the customer service conversation. The Chehalem Valley Chamber’s Wine Education Center trained more than 100 workers in 2015-16. It’s now expanding its curriculum to encompass product sales training and wine club management, says Kelsh, with plans also under way to grow consumer-training opportunities and develop a customer-shopping program. Great article! I would love to see some kind of generic hospitality classes offered to the general public for a small fee. Oregonians are amazingly friendly people but there is so much more to learn beyond smiling at folks at the grocery store and not honking other drivers off the road. Many small business entrepreneurs as well as short term rental hosts would be pleased to attend classes of this sort. Working with the resources in our communities, focusing on sustainability, and enhancing our neighborhoods are all good goals to appreciate.